The latest volume of the East China Normal University Scientific Reports published by World Scientific, has been released. 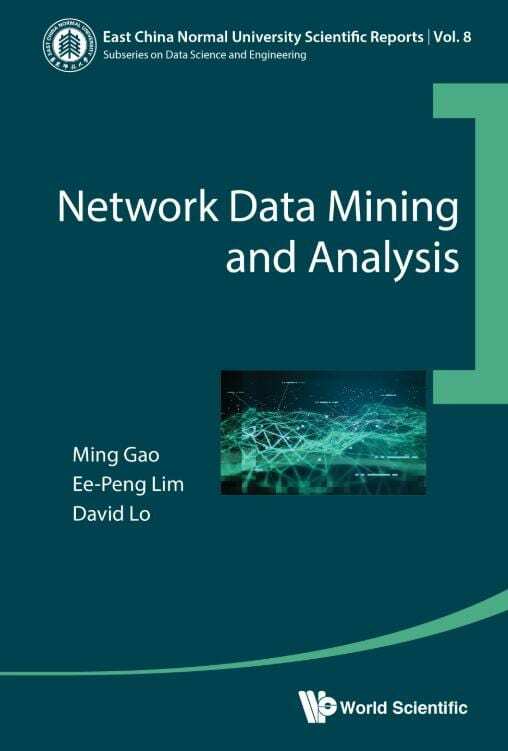 Entitled Network Data Mining and Analysis, the work is authored by three leading researchers and academics from East China Normal University (ECNU) and Singapore Management University (SMU): Associate Prof Ming Gao (ECNU), Prof Ee-Ping Lim (SMU) and Associate Prof David Lo (SMU). The book's coverage spans from basic concepts about network data, including the types of networks, graph representations in different research communities, and the expander graphs, to the research of networking mining and analysis. Topics from newly emerging fields such as network strength measurement, network linkage, network structure analysis and link prediction, and some local community detection are also included. What are social communities in bipartite graphs and signed graphs? How robust are the networks? How can we apply the robustness of networks? How can we find identical social users across heterogeneous social networks? The research in this book has been supported by the National Key Research and Development Program of China under grant 2016YFB1000905; the National Research Foundation, Prime Minister's Office, Singapore under its International Research Centres in Singapore Funding Initiative; and the NSFC under Grant No. U1401256. This book retails for US$98 / £85 (hardback). To know more about the book visit http://www.worldscientific.com/worldscibooks/10.1142/11120. Ming Gao is an associate professor of the School of Data Science and Engineering in East China Normal University. He received his Ph.D. from Fudan University, China. Prior to joining ECNU, he worked as a postdoctoral fellow in the Living Analytics Research Center (LARC), at Singapore Management University. His main research interests include user profiling, social mining, knowledge graph and computing education. He was the co-chair of the 1st International IEEE ICBK Workshop on Analyzing and Predicting Interaction Behaviors. Ee-Peng Lim is the Director of the Living Analytics Research Center (LARC) and a Professor of Information Systems in Singapore Management University. He received his Ph.D. from the University of Minnesota, USA. His research interests include social media mining, smart cities, information integration. He is currently an Associate Editor of the ACM Transactions on the Web (TWeb), IEEE Transactions on Knowledge and Data Engineering (TKDE), and few other journals. He was the Conference Co-Chair of CIKM2017 and serves on the Steering Committee of the International Conference on Asian Digital Libraries (ICADL), Pacific Asia Conference on Knowledge Discovery and Data Mining (PAKDD), and International Conference on Social Informatics (Socinfo). David Lo is an Associate Professor of Information Systems in Singapore Management University. He received his Ph.D. from the National University of Singapore. His research interests include social media mining, software engineering, and cybersecurity. He is an editorial board member of Information Systems, Empirical Software Engineering, and a few other journals. He was the General Chair of the 31st IEEE/ACM International Conference on Automated Software Engineering (ASE16) and serves (or has served) on the Steering Committee of ASE, IEEE International Conference on Software Analysis, Evolution and Reengineering, and IEEE Working Conference on Source Code Analysis and Manipulation.